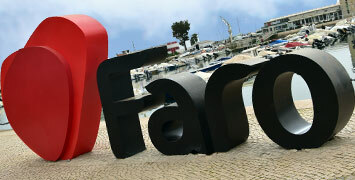 Faro is a historic and charming city, which is often overlooked by the majority of visitors to the Algarve. 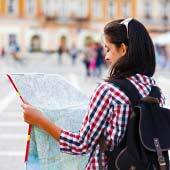 The city and its surrounding area have a surprising number of interesting tourist sights and a varied offer of enjoyable activities. 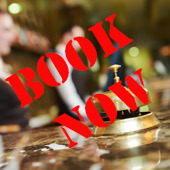 This guide will provide a suggested itinerary for a 3 day visit to Faro, either as a short holiday or as part of a longer tour of the Algarve. 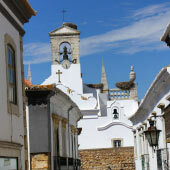 Faro has a very scenic old town, which is encircled by an ancient Moorish city wall. At the heart of the old town is the Sé cathedral and from the top of the clock tower there are wonderful views over the city and the Ria Formosa Natural Park. Other sights include the Museu Arqueológico, the City Hall and the gates for the city walls. The decorative Arco da Vila leads from the old town to the marina and the Jardim Manuel Bívar plaza, which is the central Plaza of Faro. If you head north from the plaza and the Marina, you will enter the pedestrian streets of the shopping zone and this is the suggested place to have lunch on the first day. The Ria Formosa Natural Park is a series of protected salt water lagoons and mud flats that are a haven for migratory birds and wildlife. 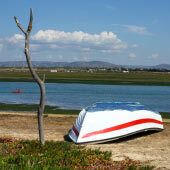 For the afternoon, it is suggested to join one of the Ria Formosa boat tours and explore the waterways in a relaxing manner. 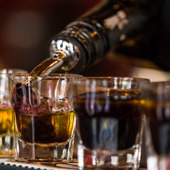 There are multiple companies that offer slightly different tours. A 2h30 guided tour around the national park and a stop at both of the sandbar-islands (Ilha Deserta and Ilha da Culatra) costs €25. 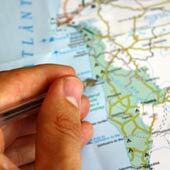 A cheaper option is to just head to the Ilha Deserta (deserted island); the price of the ferry ticket is €10. If the national park does not appeal to you, then you could visit the Igreja do Carmo and the creepy bone chapel (Capela dos Ossos). 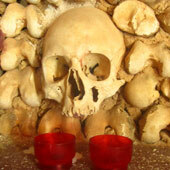 The walls of the Capela dos Ossos are lined with the bones and skulls of bodies that were exhumed from the overcrowded city’s cemeteries. 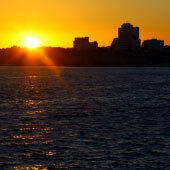 The beaches that surround Faro are very relaxed and have none of the major tourist developments that are frequently found in other Algarve towns. The best and most accessible beach of Faro is the Praia de Faro, which stretches along the 5km coastline of the seaward side of the Ilha de Faro. 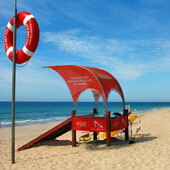 For a guide to the Praia de Faro, please click here. At the centre of the Ilha de Faro there is a small village, in which you will find bars, cafes and a hotel; this section of the beach gets very busy during the summer season but a short walk along the coast will take you to almost deserted beaches. To travel to the Praia de Faro, catch the number 16 bus (€2.25 single ticket, 20 minutes), this bus route also serves the airport. An alternative beach to visit is the “Ilha Deserta” (Deserted Island), and as its name suggests, you may expect plenty of space available to lay your beach towel on! This beach is connected to Faro by a regular ferry service (the return ticket costs €10). There is truly almost development on this island, apart from a single restaurant. The most southerly point of Portugal is located on the Ilha Deserta and it is a pleasant beach walk to the Cabo de Santa Maria headland. One fact that usually surprises visitors to the Algarve is how cold the sea temperature is, even at the height of the summer. 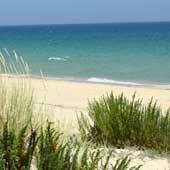 For the third day, it is suggested to visit one of the towns close to Faro. 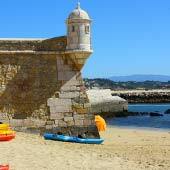 There are two recommended destinations: the fishing port of Olhao or the village of Estoi, which contains the Palace of Estoi and the Roman ruins of Milreu. Estoi is only a small village but it contains the beautiful Palácio de Estoi and the Milreu Roman ruins. 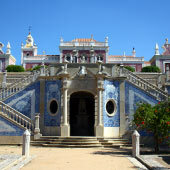 The palace is one of the Algarve’s finest examples of a 19th century Rococo styled building. The grounds of the palace contain wonderful examples of azulejos tiles (blue and white ceramic tile paintings) and the gardens provide a beautiful backdrop to the distinctive pink colour of the building. 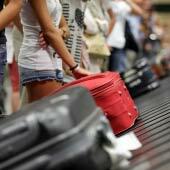 The palace has been converted into an exclusive hotel, but non-hotel guest are welcome to visit the palace. The Milreu Roman ruins (2 Euro entry) are the remains of a grand 2-3 century AD Roman villa covered a 1 acre site. Sections of the mosaics are still visible while part of the villa was incorporated into the 13th century farm house that was built on the site. 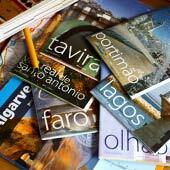 For a guide to Estoi as a day trip please click here. 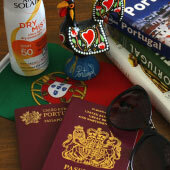 Olhao is a busy working town that has a completely different atmosphere from Faro. There is a large fishing harbour and the shoreline contains traditional buildings with a maze of old fishermen’s houses behind. 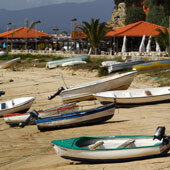 From Olhao harbour there are tours of the Ria Formosa Natural Park. The most distinctive building of Olhao is the Moorish inspired fish market.